Your Pond At Night: PondXpert - Buy pond liners, pond pumps, pond filters and more. The first accessory to consider adding, if you have not already done so, would be some pond lighting. There are a lot of different ways to light your pond and water features. Underwater lights will highlight your fish swimming, external spotlights will highlight features around your pond such as waterfalls and fountains while contemporary light designs can become a feature themselves. When buying submersible pond lights, you now have the choice of LED or Halogen bulbs. The main difference being the yellow warm glow that a halogen bulb produces in comparison to the contemporary bright white light that the LED bulbs produce. However, it is also it is also worth noting that LED bulbs are more energy efficient so cheaper to run and have a notably longer life than halogen bulbs. 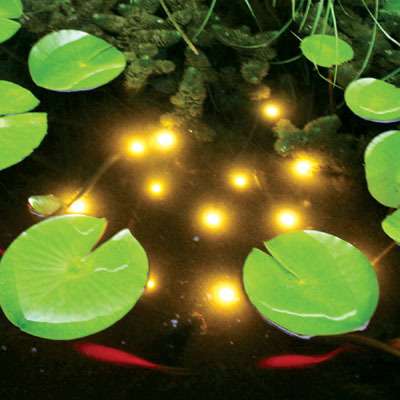 Submersible pond lights are fantastic for highlighting your fish swimming at night. With the PondXpert Brightpond and Pondolight light sets, you can change the colour of the lights with the complimentary coloured light filters (red, green, blue or orange). 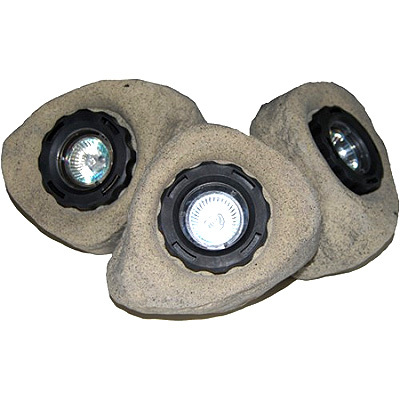 If you’d like to disguise your submersible pond lights then the PondXpert Triple Rock Lights set is cased in a realistic stone effect casting and will blend into your pond environment. If you have taken the time to create a beautiful water feature in your pond, then the addition of lighting could transform it into something magical. You can make your waterfall glow by angling lighting sets at the water flow. Again, the PondXpert Brightpond and PondXpert Pondolight sets will do this well. Many people are not able to have mains powered lighting due to the location of their pond. Solar lighting is becoming more popular and can provide a great addition to absolutely any pond! The PondXpert Solar Sublight can be used in or out of the pond and sits in an adjustable cradle so can direct light to any feature you may wish to illuminate.